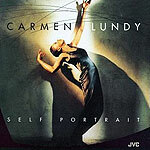 Carmen Lundy has it all as a jazz vocalist: pipes, timing and taste. Her new album on JVC shows her as one of the pre-eminent jazz singers extant, mixing old standards like "Spring Can Really Hang You Up the Most" and "Round Midnight" with a cover of a non-jazz nugget like "My Favorite Things" and adding in first-rate songs of her own like "Better Days." Lundy's performance here is so complete that it's difficult to cite any one characteristic as being superior to another. She has a Sinatra-like ability to linger just a tad past the beat, her phrasing is on a par with Carmen McRae's, and few singers have the strength to hold a note with Lundy's authority, giving it just a touch of husky tremolo. The outstanding combo behind her, led by pianist Cedar Walton and including bassist Nathan East and saxophonist Erne Watts, never lets up, pushing Lundy again and again, respecting her as an equal instrumentalist. This is, from start to finish, an outstanding straight-ahead jazz recording.